When snow piles up on a roof, it can exceed the structure’s snow load and cause problems ranging from leaking to complete collapse. Taken individually, it is hard to fathom how dainty snowflakes can be the first step in the collapse of a building. But in northern latitudes, where enough of those flakes fall to build up to feet of snow, letting them pile unchecked can mean big trouble for homes and outbuildings with increased snow loads. Snow load is the downward force on a building’s roof caused by the weight of accumulated snow and ice. Regardless of design or structure, once that snow load is exceeded, the building is in danger of collapse, Nagy said. How do you calculate snow load? To calculate the snow load on a roof, you need to first determine how much the snow weighs, and that can be tricky because weight will vary depending on if the snow is dry and fluffy or wet and solid, Nagy said. There are a few ways to calculate that weight. You can shovel out a cubic foot of snow from the roof, place it in a container and quickly weight it on a scale. Then measure the depth of snow on the roof and multiply it by the weight of a cubic foot of that snow. Thus, snow weighing 10 pounds per cubic foot and at a depth of 18-inches on a roof is exerting 15-pounds of pressure per square foot. If you cannot weigh the snow yourself, online calculators such as the one at www.omnicalculator.com allow you to plug in snow “weight” based on type such as fresh snow, settled snow or wind packed snow. The online calculator takes type of snow into account instead of exact weight to determine snow load. Modern building codes, Nagy said, allow for extreme, 50-year snow events when engineering for snow loads. What damage can snow do? The ultimate damage snow can cause is roof collapse, but that’s not the only problem. Ice dams are created when a ridge of ice forms at the edge of a roof and prevents melting snow and water from draining off. The water can back up behind this dam and leak into a building’s roof, down the walls and into ceilings. Water can also rot wooden beams and trusses that support a roof, Nagy said, thus creating the danger of collapse. Additionally, leaking water can create cosmetic damage with water stains along an interior wall or on the ceiling. For a building to collapse from snow load, it takes enough snow to build up, but Nagy said human error or negligence can speed up that process. Nagy also advises building owners keep tabs on where the snow is piling up or has the potential to pile up. How do you control snow load? 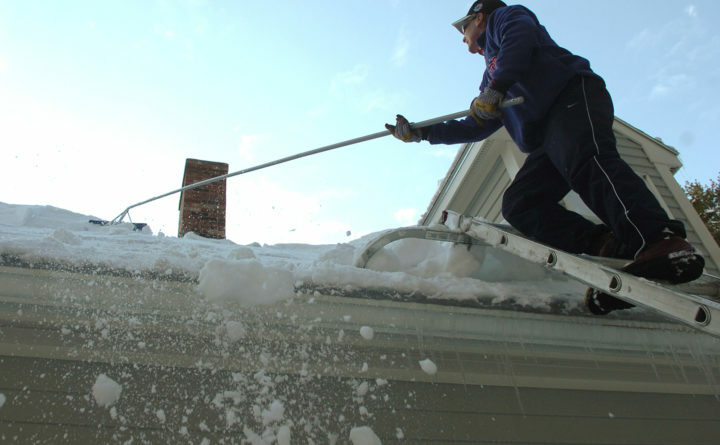 The most important factor is protecting a roof is to keep as much snow off of it as possible, and that means old-fashioned shoveling, Nagy said. At the most basic, you will need to invest in a good, metal snow shovel if you don’t already have one. Then safely access your roof by ladder or an opening directly onto its surface if there is one. It is not a good idea to do this solo in case you run into trouble or happen to fall off. At the very least, have your cell phone handy. Another tool is a “roof rake” that extends and allows you to remove snow from ground level. These rakes pull the snow to the edges of the roof where it then falls to the ground. Raking from the ground can be easier and safer than climbing one or two stories up to access the snow. However, this method becomes more physically challenging when a roof does not have a steep pitch. It can take some serious upper body strength to pull snow down and off a flatter roof. If using a roof rake, be sure to stand back far enough to avoid having the snow fall on your head as you pull it off. Shovels and roof rakes are available at most hardware or farm supply stores. You can also outsource the work. People make a living shoveling roofs and can be found via online searches, or by browsing under the “looking for work” sections on bulletin boards at grocery stores, feed stores or other areas where ads are posted. Nagy said it is also important to keep a roof and supporting beams in good condition, and to not wait to make any repairs. Finally, make sure the building is engineered properly for the amount of anticipated snow where it is located. If it is not, an engineer or building inspector can come in and make recommendations on how to upgrade the structure to match anticipated snow load. And, in the meantime, keep it shoveled.